LITA FORD Premieres New Track "Killing Kind"
LITA FORD is set to release her latest album Time Capsule on SPV/Steamhammer on April 15, 2016. The very special and unusual recording turns back the clock to a time when honest, down-to-earth rock music was still handmade and recorded without digital tricks and contraptions. Time Capsule is a "throwback" record that boasts identifiable voices and brilliant players jamming without any planning or pressure. Some of the album`s highlights: Billy Sheehan (bass), Rodger Carter (drums), Dave Navarro (mandolin), Jeff Scott Soto (vocals) and more! Time Capsule contains ten songs plus an intro and will be available as a digipak as well as an LP version and download. It`s Ford`s gift to fans who love the ´80s, when thrilling vocal performances, raunchy riffs, and loud, growling guitars were as essential as oxygen. The second song from Time Capsule, "Killing Kind", has been released and you can check it out below. 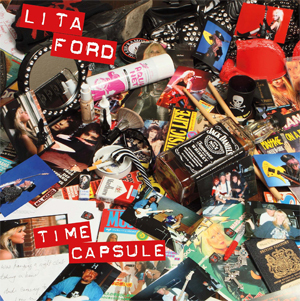 In support of Time Capsule, LITA FORD is on tour with HALESTORM providing direct support on their North American tour. Select headline dates and festival appearances have also been added! A complete list of dates can be found below.